I went to the sneak preview last night of the film Valkyrie, starring Tom Cruise. I am by no means a Tom Cruise fan and I definitely wouldn't have paid to see it, but it wasn't as bad as I was expecting. I have been reading ominous warnings about this film for ages on the gossip sites (the film was delayed numerous times, it got poor reviews from test screenings, etc. ), so I wasn't expecting much. It turned out to be better than I had hoped, but I doubt it will do gangbusters at the box office. Whose bright idea was it to release a film about Hitler at Christmas-time???? The film is based on a true story (so they inform us at the beginning) and details one of the 15 or so attempts to assassinate Adolph Hitler. Tom Cruise portrays Colonel Claus von Stauffenberg of the German army, who was wounded in Northern Africa. 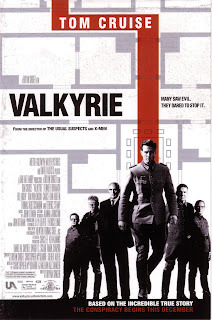 Now back in Germany, he joins a group that is plotting to use Hitler's own emergency contingency plan, Valkyrie, to seize power. My main problem with the film was that it was so difficult to tell the characters apart. Helpfully, they put an eye patch on Tom Cruise and dressed him in a lighter colored uniform than everyone else, but most of the other characters were impossible to identify. Whose side where they on? Had we seen them before? Did they have a history with Cruise's character? It was impossible to tell. All of the actors fell into two categories: the younger, steely-looking, blond types, and the middle-aged, overweight, blustery types. They tried giving a few in the latter category funny-looking glasses to help to distinguish them, but it made no difference. Cruise's performance, sadly, was terrible. He has two expressions, depending on what is called for a the moment: scowling indicates he's really serious this time, and smirking means he's trying to lighten the mood. That was the range of his acting style in this film. Also, I know it's supposedly based on a true story, but come on. If you are sending someone out with a disassembled bomb, with instructions on how to assemble and arm it, would you send the guy with one eye, one hand, and a total of only three fingers? Me, neither. One of the reasons I was looking forward to the film was that it stars one of my favorite actors, Bill Nighy. He was nearly unrecognizable at first, with his trademark floppy blond hair slicked back (he also got the funny glasses treatment). He absolutely didn't disappoint in his role as General Friedrich Olbricht. He was twitchy, nervous, indecisive and high-strung. All the things we've come to know and love! One weird thing is that the security for this screening was out of control. There were 3 people stationed at the entrance to the auditorium and they were searching people as they came in for cameras and "camera phones." They were awfully severe. I wanted to say, "Just relax. No one is THAT anxious to see it." I thought that was very odd. I go to several free screenings per month and I don't remember this level of security before. Someone has an awfully inflated perception of this film. On another topic, London is once again featured in this month's issue of Fate magazine. In the article "London's Phantom Menagerie," author Neil Arnold details the long history of strange creatures that have been sighted skulking or flying around London over the centuries. Among the apparitions that have been seen over the years have been griffins, dragons, "peculiar hominids" (I've seen quite a few of those, myself) as well as phantom bears, cats, birds, dogs and "hellhounds." Quite interesting reading! I've going to wait for DVD even though I adore Branagh and Izzard. I just cannot stand to watch Tom Cruise anymore. To me he plays every character the same way and I just can't get past the some of the weirdness he has displayed in the last few years. I'm with you though...why the Christmas release? I agree, I think most people are over Tom Cruise. I really didn't realize Eddie Izzard was in the film until I looked it up on IMBD. I just have a hard time recognizing him without the makeup!